How to find the best night vision goggles glasses for 2018? DISCLAIMER: Knight Visor sport glasses do NOT provide an Instant Magical Solution and will not cause your vision to be better at night than during the day. Extended use is required in order to notice a change, and to enjoy the benefits provided by your BLUPOND night vision glasses for driving. THROUGH LAB STUDIES, BY MIRRORING THE LIGHT SPECTRUM OF THE HUMAN EYE, we've built our Yellow-Tinted Lenses to filter out harmful Blue Light, using yellow shades which cause the least stress on the eye. SET YOUR NIGHTSIGHT TO YELLOW - TAC Semi Polarized Blue Light Blocking KNIGHT VISOR designed to transform your vision to a yellow view + computer blue-light polarization. BLUPOND night driving glasses - anti-glare HD vision blue blocker glasses protect eye from Blue Light, reducing contrast from bright blue / white glares & flashes for a vivid nighttime drive. Polarized safety sunglasses for men block digital device & bright headlights' Blue Light with 100% UV400 BLUPOND HD vision night glasses. DESIGNER SEMI-RIMLESS FRAMES FOR A LARGER FIELD OF SIGHT, anti glare night driving glasses permit maximum light to limit distortion. While some distortion is unavoidable, yellow sunglasses for men polarized safely shield your eyes from harmful Blue Light. 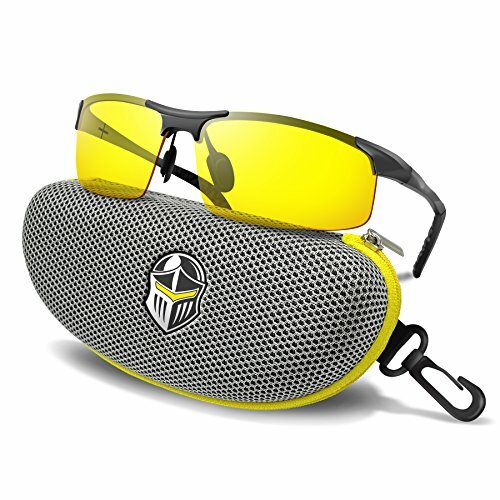 Metal frame construction built to survive inevitable drops and dings, plus nightguide polycarbonate, shatterproof, yellow-tinted night tac glasses with blue light neutralization, protective safety shades for cycling / motorcycle nite drive.